Love Segretos work and Leslie is a doll.....a true master at what they do! No need to count me in for the giveawy as I am already a lucky owner of this fabulous book, just wanted to say its an AMAZING book chock full of beautiful inspiration. The book is amazing and we've poured over every page...lucky person that wins this one!! beautiful!!! Hugs and wishes for a week filled with happy! Karena...great interview...I am a happy follower...thru Linky...I am going over to Leslie's blog....This a wonderful book...crossing my fingers that I am a lucky winner!!! 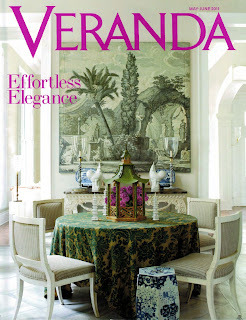 I love, love her wall murals and finishes...the furniture is stunning...Such talented artisans...just incredible.. 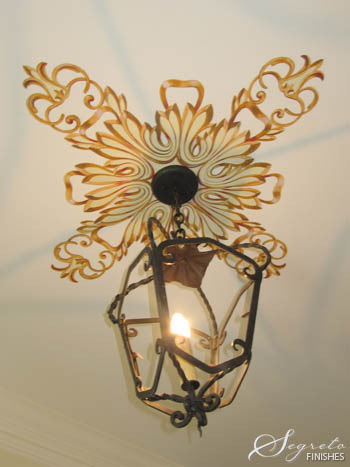 The quality of work is great and so much diverse too, from wall murals to furniture painting. Thanks for keeping us un-informed people updated about the talents of so many talented artists. Great giveaway! Don't enter me because my neighbor has the book and luckily she shared it with me already. It's quite inspiring. I know the winner will enjoy it very much! Love her work and she is such a nice lady. I am planning on doing a post on her, waiting for some new photos. Loved the book, Karena. 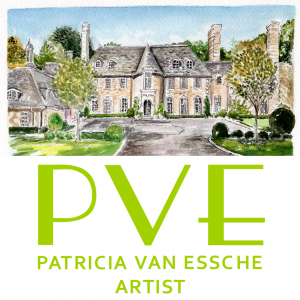 Leslie and her team have amazing talent, and really work with some of the most elite interior designers to create magical spaces. Just divine! The book really is a MUST HAVE!!! You'll love your copy, Karena!! Everytime I see a picture of her work I am more and more amazed! I especially love her plaster work. Love her down to earth advice about being grateful for the work and being on time - a good reminder that the basics of hard work and discipline really pay off in the end! I love this book and can't imagine anyone not owning it yet. Her work is truly amazing. Love the interview and learning more about this fabulous artist! 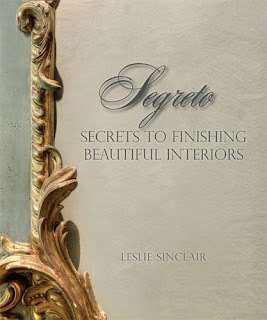 I am a huge fan of Segreto Finishes! I follow Leslie's blog, FB page, and Pinterest. We just bought a home that needs to a facelift so I could sure use some inspiration! I hope I win!!!! Thanks for stopping by Karena and entering my eshakti contest...send others my way!! thanks for sharing more about Leslie! There is no telling how many pictures I have pinned that are Leslie's! Her work is amazing and I will never get tired of seeing it, reading about it or pinning it! Loved this interview! Thanks, Karena!! Un livre qui me semble merveilleux... Merci pour cette belle publication. some really nice things. 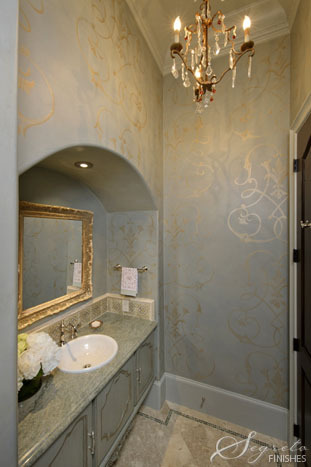 I love that gold on the powder room! What wonderful paint treatments! Amazing artist! WOuld love to have that book, it looks delicious! 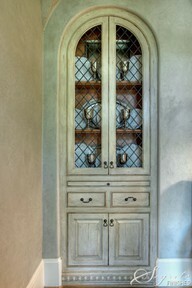 Love her kids rooms and the beautiful patinas on the furniture. I also love the gold leaf ceiling I saw...I gold leafed the inside of my cabinet...not quite as smooth looking, but it is a great affect. What a great giveaway Karena, my fingers are crossed. As someone who is accused of "insulating with paint" I certainly can appreciate the attention to detail and quality craftsmanship. Wonderful interview! 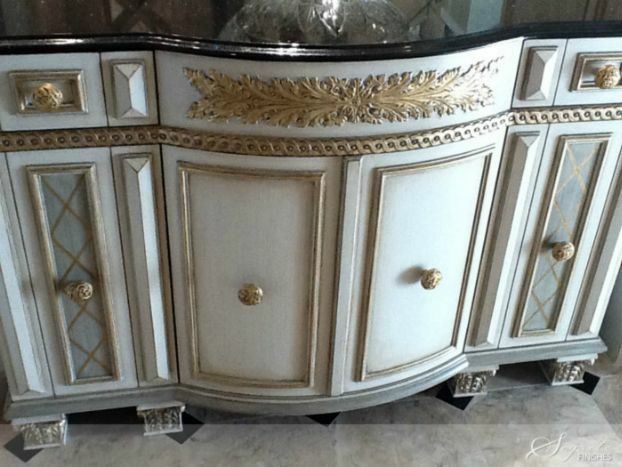 I love all the patina and the Gilded Sideboard is stunnig. Karena, thanks for coming by and commenting at Quirky Vistas. Leslie's work is lovely. I love the inside look at how others find their way to where they are. Good stuff! I love Leslie design, they are just gorgeous. I follow her blog. I follow Segreto on Facebook. 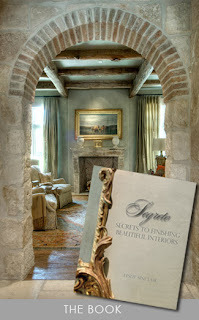 Lovely interview Karena... Segreto Finishes does amazing work!! Another fab interview, and gorgeous photos, wow! Great interview! Leslie you've set the tone for great finishes in home interiors. All art takes great discipline, training, customer service, and follow-through. 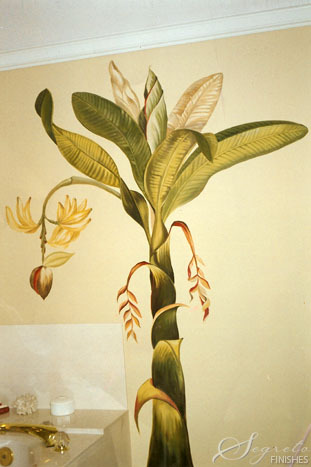 A sort of corporate world set-up with an artistic culture which is really difficult to balance. You've done that beautifully. I would love to win this lovely book to add to my designer...must have library. Thanks you for this generous giveaway. I am following Leslie's blog. Thanks for the tip - I'm going to try & get my hands on a copy, hopefully someone will stock it in Australia! as usual a great giveaway!! What a lovely book! I would be proud to have it in my design library. Also, good news! 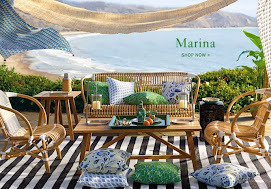 You won the Wayfair $50 gift card! Congrats and enjoy. I'm sharing your giveaway on FB...this is fabulous! Hi Karena - Thanks for your fabulous interview / feature on Segrato! Where have I been? I must have been living under a rock...yikes! I do not own this book (so embarrassed), and look forward to be the lucky winner. If not, I will purchase it from Amazon as I've read all the glowing reviews here on your comments page. I'm heading over to follow Segrato / Leslie. What an amazing and talented artist!! Okay, I totally goofed on spelling "Segreto" above. I am correcting myself. So sorry, Leslie. Karena, thank you for finding me and sending me Leslie's link. Her work is absolutely beautiful! I am following everyone. I can't wait to see her book. Hi Karena! I love Segreto, been a follower/subscriber on everything for quite sometime now. Wishes for the lucky winner to enjoy such a wonderful giveaway. Have a safe and blessed Memorial Day weekend. Such an amazing art form! 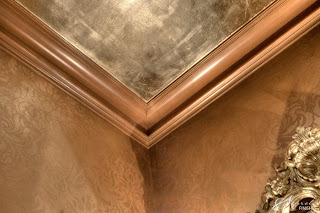 I love the venetian plaster finishes! Gorgeous work, thanks for featuring her Karena. Hope you have a wonderful long weekend! Great interview Karena! Amazing talent. Hi Karena, This looks like a beautiful book. I love the plaster finishes she does. Thanks for sharing your giveaway at the OHP. How cool! Love the old world look of these treatments. What an interesting book and very cool post! I would adore having this book! Thanks for visiting Chic Provence Karena! You continue to find the most amazing artists. She's very talented. Great interview. so creative. I'm sure the book is equally lovely too. Wow Karena thank you for posting about this gorgeous looking book, such incredible finishes especially the powder room wall art. I'm so glad that you stopped by to tell me about this book giveaway. 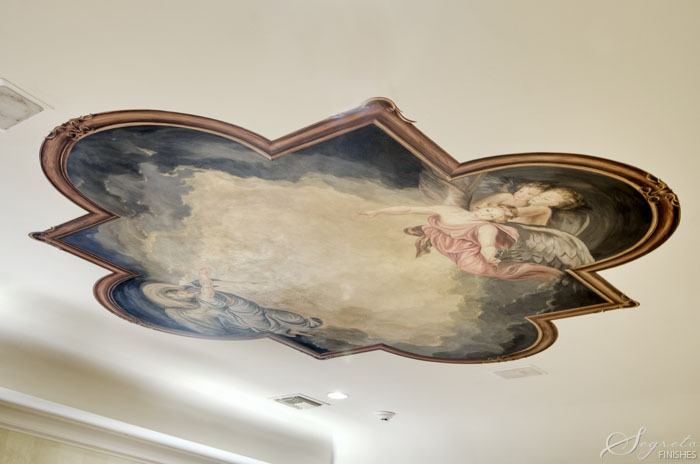 There is NOTHING on her website that I don't love but the ceilings are amazing! Just thinking about working overhead makes me tired and they are all beautiful! I'm already a follower of your but somehow I missed this post. Thank you for stopping by today and leaving a note. Karen: Thanks for the hot tip. I want the book and loved the website. 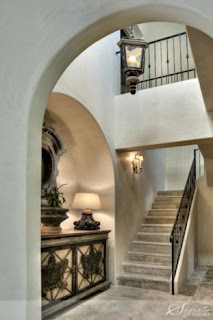 The stripes in decorated finishes is my fave, but I love the painted floors! Wow! I'm so glad you stopped by and pointed out this giveaway! I used to be obsessed with faux finishing and murals...I even used to do them myself!! I would love to win! 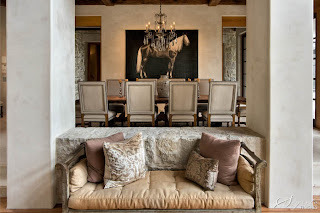 I checked out her site and I love it all but I especially love the painted floors! I also signed up for her blog emails and am following her on pinterest and I'm already a follower of yours! Hope I win! Wow... what an amazing giveaway... would love to be the new owner. Please throw my name in. another great giveaway Karena! 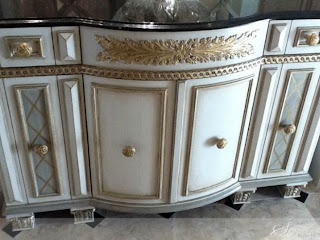 I love this post--decorative painting can completely change a room, all for the better-love it!